I needed an easy foster after 3 months with Georgia and her pelvic fracture and resulting cage rest, so I took a 2 week kennel cough case. 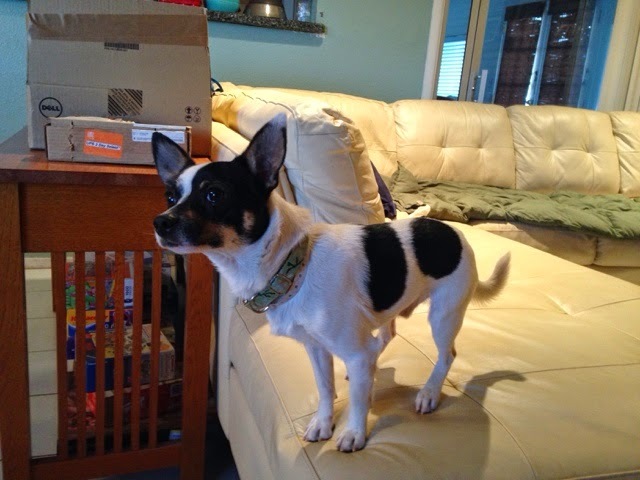 Paco is a chihuahua mix, mixed with something much bigger than a chihuahua. He weighed 18 pounds and only some of that was being overweight (which he was). Paco was a shy dog and was slow to warm up. He was more comfortable with Pat than me, but he really wasn't interested in either of us. He liked the dogs right away, but he didn't settle in quickly. Despite his unsure state and aloofness, he was very polite and well-behaved. He spent his first few hours watching the dogs and not looking at us. 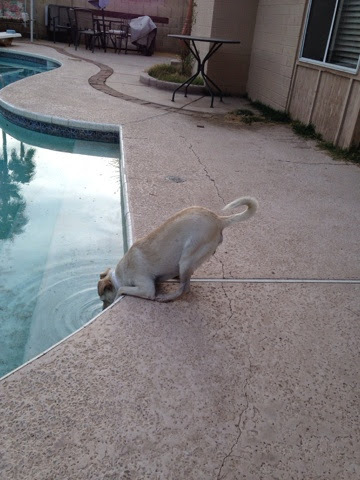 He learned to drink from the pool after watching Frankie and Georgie do it. I read in his material that prior to needing a foster for kennel cough, he was on a behavior hold. He was hiding and growling in his kennel. They worked with him quite a bit but he remained aloof. 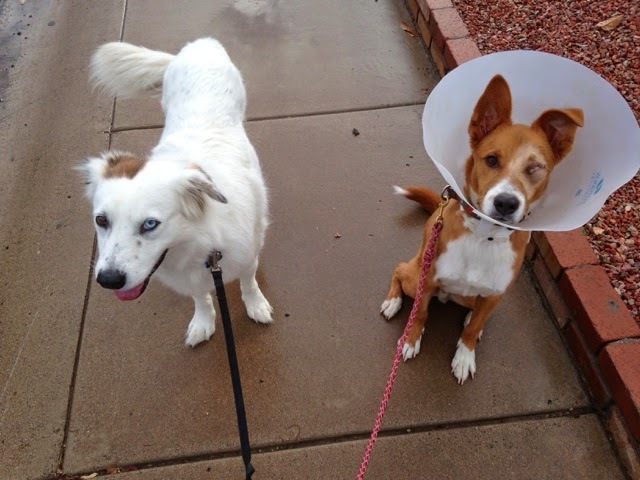 They found that he did much better when other dogs were around. 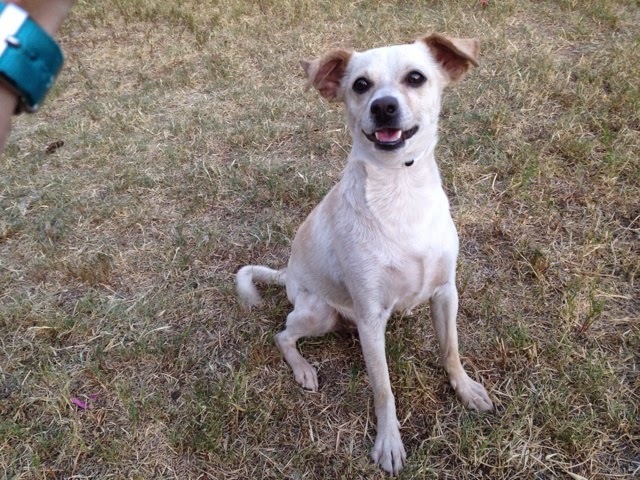 Paco got over his kennel cough in the 2 weeks and was taken back to be put up for adoption. And there, he waited. And waited and waited. I knew he would be a hard adoption since he doesn't really like people until he has a chance to warm up. 15 minutes in a the get-to-know-you-area is not enough time for him to warm up. I networked him like crazy - posting him on my work classifieds, posting numerous times to my facebook page and having everyone share the post. 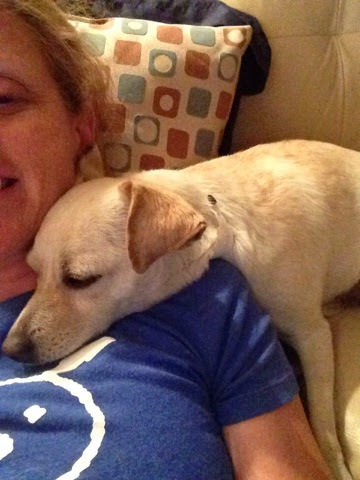 I had a guy from our IT department say he saw the picture of Paco sleeping on my shoulder in his facebook news feed, posted by someone I don't even know! The word was out on what an awesome dog Paco was, but yet, no one was adopting him. :( My heart was breaking every day that I checked the shelter website and saw poor little Paco's picture still there. One of the attorneys at my firm shared the ad that I posted with his wife. He told me that his wife, a city attorney, was doing everything she could to find Paco a home. She emailed me a few times to ask his status. Finally, after 3 weeks of no adopters and poor Paco being sad and terrified at the shelter, I decided that if no one took him over Memorial Day weekend, I would just have to adopt him. He isn't the dog I want, but he is sweet, cuddly, and very very easy. On Friday I got an email from the attorney's wife saying that a friend was going to adopt him on Saturday ! Yet, on Saturday night, his picture was still on the website showing that he was available. They didn't take him. Very sad. :( But on Sunday I got an email from the attorney's wife's friend saying that they had gone and picked up Paco. He was currently staying with her but he was going to have a home with the family of one of her friends. He would have a mom and dad and 2 kids to play with. And, she said if for some reason it didn't work out, Paco would come back to live with her and so I did not have to have anymore sleepless nights worried about poor little Paco. Networking works! And now a co-worker's wife's friend's friend is the happy owner of poor little Paco! YAY! 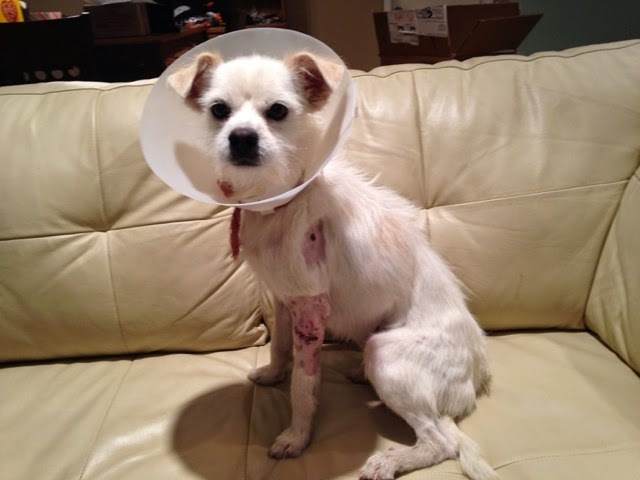 Little Smitty was a quick foster who just needed some time for his wounds to heal. 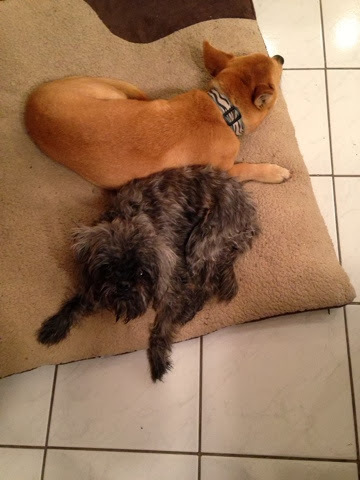 He was a young cairn terrier mix. Next up was Georgia. It had been awhile since I'd had a hard foster so I felt I needed to do my part. I took Georgia. 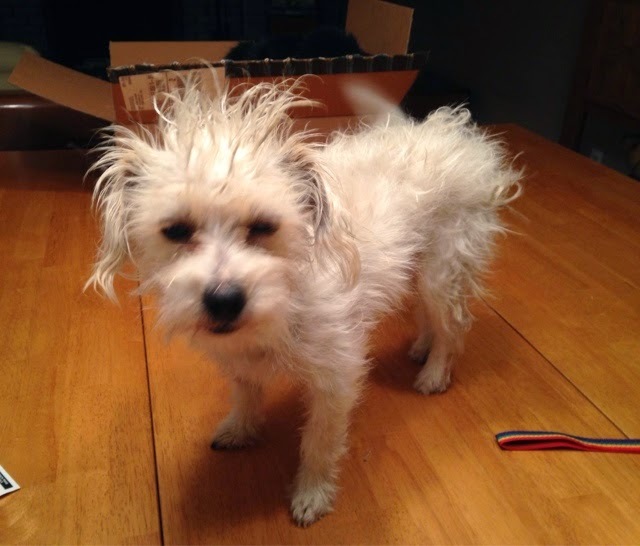 In addition to having a really bad hair day, she had a broken pelvis and required 2 months of cage rest. She was a teeny, tiny thing who weighed almost nothing. But despite her wee size, boy, could that dog scream! She didn't bark, she screamed. And she screamed whenever she was caged, which is all the time when you're on cage rest. We got new neighbors during the time we had Georgia and I had to assure them that we wouldn't have her forever. It was January so our windows were always open, and their windows were always open, so we all had to endure the screaming. The screaming which never ended. When she wasn't screaming, she was awesome. She was cuddly and sweet, and housetrained. She LOVED to play with the cat, she loved her toys and she loved the dogs. We put the toy box in her x-pen and she'd crawl right into the box so she could play with every toy we have. When she was healed enough to play, we learned that she was a fetch super-star. But by then, we were so annoyed with her screaming that even though she was no longer caged and thus no longer screaming, we were eager to take her back to the shelter. 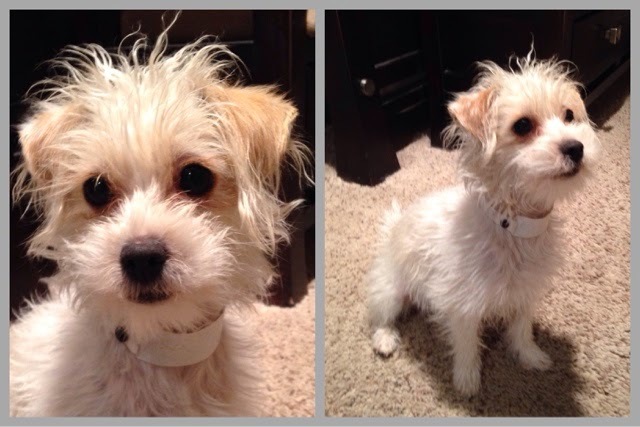 Even after a bath and a brush, the bad hair day persists. Andy was very close to being a keeper. 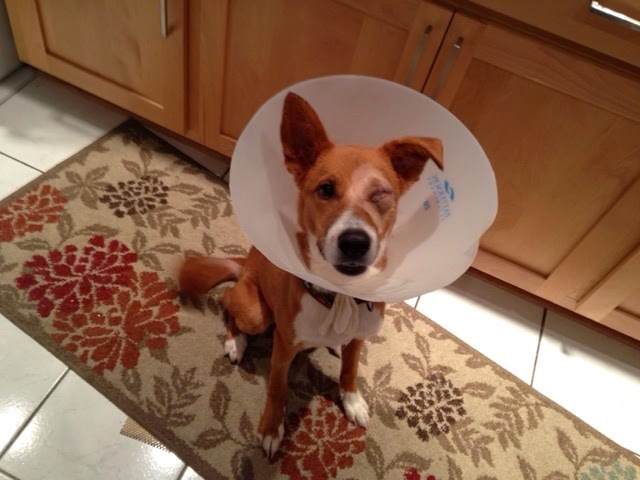 He was a 9 pound chihuahua that I fostered for cherry eye. When I picked him up I immediately fell in love with him. He was very athletic and sturdy for being such a tiny little dog. He got along great with the other dogs, he was housetrained. He was very agile and even in his cone, he could jump up on the chairs. He was perfect. 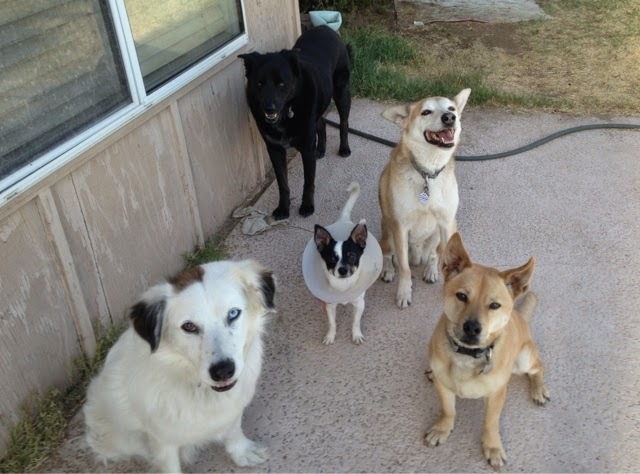 Here he is with my dogs and my old roommate's dog, Chugg. See how tiny he is? So cute! And I loved his striped face and spotted body. So cute! He had two speeds: 100 miles an hour and cuddle. So awesome! Once when I brought the dogs in from outside, Al wasn't up on the table where he lives but on the kitchen floor instead. (On a non-Andy note, I think Al might be going deaf because he always gets up on the table when he hears me open the back door to let the dogs in.) Andy raced to him and started attacking him. I picked Al up to get him away from the fury of the little chihuahua. What did Andy do? He leaped into the air and caught Al's hind leg and held on like he was a pit bull with locking jaws. Andy - you are a chihuahua! And you are not a keeper. Even despite his cat-hating, I kept him longer than I needed to because I liked him so much. When Al wasn't around, he was so much fun! But I finally returned him for adoption and he was adopted 2 days later, hopefully to a home with no cats! His kennel card stated he wasn't good with cats so let's hope the adopters believed it. Just before Christmas we fostered a border collie mix named Adam. 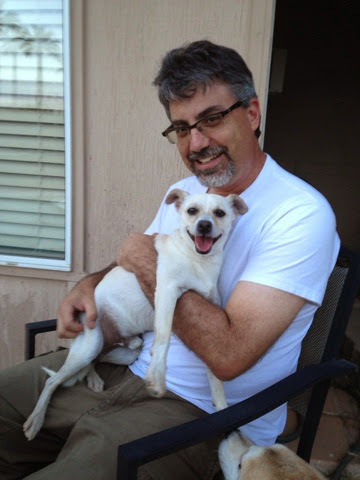 He was bigger than my usual fosters, but he was the littlest dog the shelter had available at the time and I just hoped that Mo wouldn't complain too much. As you can see, he lost an eye. We took care of him while he healed from his surgery. I don't know what happened to injure his eyeball, but I'm guessing whatever it was was his own fault. Within a day, I changed Adam's name to Atom because of his atomic energy. The dog was everywhere at once, running, playing, jumping up on the chairs, even jumping up onto the counter where I found him happily eating kitty's food. Despite his crazy amount of energy, I really liked Atom! 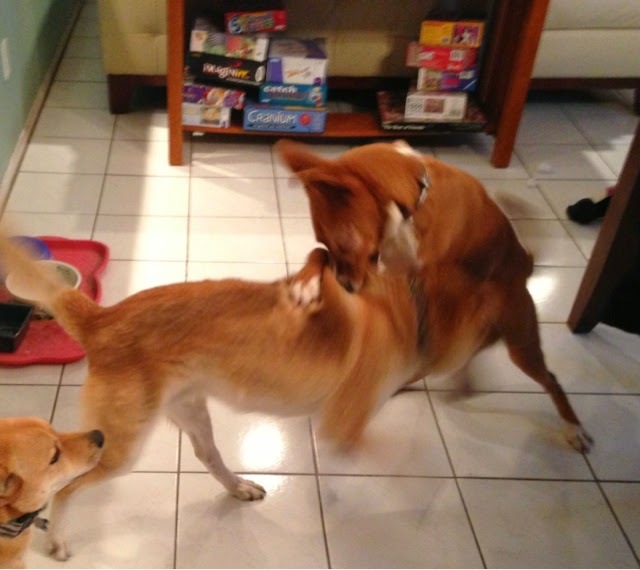 He was eager to please, easy to train and he loved to play with the other dogs. What has 7 legs and 3 eyes? I was worried that his spastic behavior might prevent him from being adopted right away. I decided I'd give it a week and if he wasn't adopted, I would adopt him. I don't know how he would do with agility since his depth perception might be off (though it didn't hinder him at all that I could tell) but I was willing to give him a try. Alas, I had no need to worry. Atom was adopted the same day I returned him to the shelter. It turns out that he was adopted by a friend of a friend. At the Bacon's Christmas party, my friend Jen told me she saw some pictures of Atom (now Buster) on facebook and she thought that I had adopted him. Then she realized that it wasn't me posting the adoption pics - it was a teacher-friend at her school! Small world. I am now facebook friends with that teacher-friend and I'm able to keep up to date on all the Atom, I mean Buster, fun, including his graduation from obedience school! He's such a good puppy!! I have a new foster. Her name is Cookie. She is a Brussels Griffon mix and she is delightful. I have her because she has kennel cough. I wanted to change her name because Cookie is a dumb name, but my friends, the Cookies, thought I was dumb for thinking it was dumb. In deference to them, Cookie got to keep her name. She was super playful. She loved her stuffy toys, she loved the dogs, she loved the cat, she loved people. Not surprisingly, she got adopted right away!